All charms are not created equally. 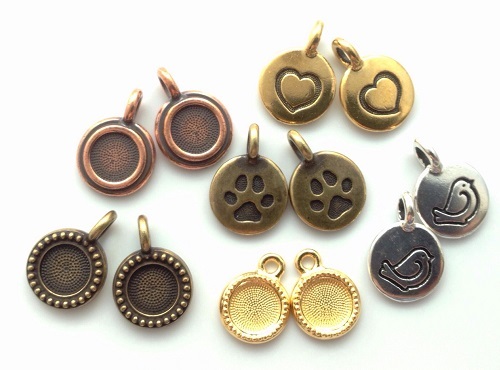 Well made charms make jewelry designs far, far better. 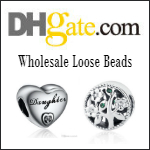 One company which makes charms and other findings exceedingly well is TierraCast which is based in California. I received their newest line, the you too Collection (shown below) for review. It didn't disappoint. They've following up their original you collection which I also reviewed a while back. The you too collection has numerical charms as well as whimsical ones such as the bird, paw print and heart in 4 different finishes. They also introduced their ball chain and ear wires. But the delicate bezels are the showstoppers because Tierracast precision manufactured to fit Swarovski flat back SS34 crystals (7.1 mm i.d.). These were my absolute favorites from this new line. The bezels and rivoli frames with pre-glued Swarovski crystals! 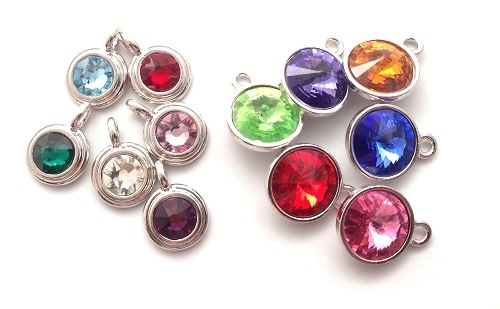 They come in 15 colors - 12 birthstone and 3 neutrals. I used the smaller pre-glued Swarovski crystals in bezel charms as well as some of their new charms to make geometric inspired spiral wire bookmarks. The tutorial for this will come out later this week. 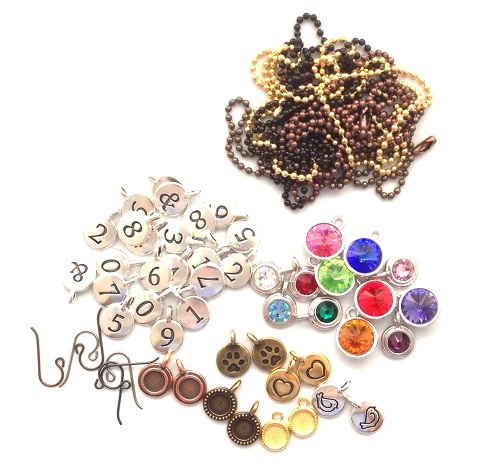 Charms come in useful for all sorts of bracelet designs - kumihimo, wire work, crochet, beading etc! I used Tierracast charms including those from earlier collections for a series thread and cord wrap bracelets designs. I also used some of the clasps Tierracast makes too. The tutorial for making these bracelets FAST with a simple tool will also be out later this week. If you would like to win TierraCast's new you too collection worth $75, please make a comment below. Make sure you leave contact info if you do not have an online shop or blog. It ends in a week's time at 6 pm EST Monday, September 28, 2015. I will pick the winner randomly and announce the results as soon as possible after. So be sure to leave a contact email if you don't have an online link or make sure you come back and check! Otherwise I will redraw in a week. Good luck! All images were captured using my iPhone 5, the camera+ app and the Modahaus TS320 Tabletop Photo Studio in natural light. Photo editing was done in-app with final tweaks in Adobe Photoshop Elements. 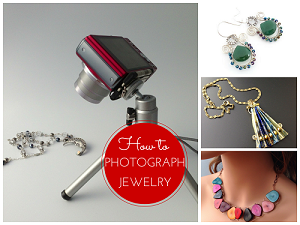 Click for more information on my How to Photography Jewelry Webinar. All I can say is fabulous! WOW! So much design inspiration with these pieces. I would LOVE to win this giveaway! I love TierraCast products, but they are virtually impossible to find where I live (other than by mail order), so having this collection would be wonderful. The pre-set Swarovski crystals are my faves, & I know someone who would adore the paw print charms. I am a blog subscriber & follow you on FB. 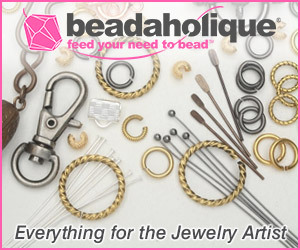 Thanks for everything you do fo the beading/jewelry community. Pearl...thank you again for all the wonderful posts and giveaways. I love Tierra Cast and would love an opportunity to win more products. My grandson has just started to make jewelry. I have been sending him small items that he has make earrings. These Tierracast items would be wonderful for him to expand his jewelry making skills. Those bracelets are lovely ! And I would love to win some of these charms .... I am a follower , and I appreciate the ideas that you show us regularly. What an awesome and generous giveaway! I am huge fan of Tierracast products and the inspiration of designs are limitless! I am a loyal blog follower! Like you I think my favorite are the Swarovski crystals. They are gorgeous as always. Tierracast are sooo good! Have had a few of their pieces to use before n loved the quality of them along with the reasonable prices. Would love to win this lot. Am a blog follower and subscriber. Can be contacted via retro-grrl@hotmail.com fingers crossed! Love all things Tierra Cast! I'm a FB and Pinterest follower, too! Thanks! As always, thank you for having such amazing giveaways. I love Tierra Cast products and these would be an awesome addition for little personal touches on pieces of jewelry I make. Thanks again, for the giveaway. I love the bracelets, particularly the red and green one and cant wait for the tutorial. Thanks for another great giveaway. If it is Tierracast you know it is quality. I would be thrilled to win this generous giveaway. Thanks Pearl. I admit that I was a winner of one of TierraCast's giveaways and the quality of their charms and findings is superb, the detailing is awesome and the weight and feel of their products is luxurious. Whomever wins this giveaway will be one very, very fortunate person. Am a big fan of TierraCast's quality and designs! Love Tierra Cast for their quality products, and it looks like they have done it again with this collection! Tierra Cast components lend themselves to so many different design applications, they are an essential part of my pre made components stash!! I would love to add this line to my favorites - awesome! Wow!! I would love to win. Have some great ideas. wow...this would be so awesome!! my brain is just spinning with ideas, just in case i win!! These would be great to add to my jewelry designs. 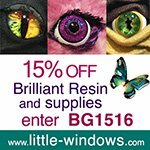 Follow your blog, always fantastic designs and info. What fabulous designs you have come up with Pearl!! I said 'OH!' when I came to your bookmark designs!! I sell quite a few bookmarks but they are usually to the traditional hook ones with a few angel paper clip ones on the side. I'm always thinking of different ways to make bookmarks so this is going to be a fun tutorial. PLUS - adding any type of Tierracast product always makes things special! I also really liked your cord and thread bracelets. How cute are those!! Looking forward to your tutes coming up my friend! Tierracast always come up with new and interesting conponents that sing out to be incorporated into all jewellery designs. Would really love to try these out in my designs!! always looking for new items! Wow! These are really beautiful. Right now I'm trying to think of uses for the little numbers. Thanks again for all that you do! I would love working with these, especially now because I am working with cameos and unusual frames for them. I love your site Pearl, I always learn so much, thank you! I would love these to work with, they are lovely! Thanks for sharing this wonderful chance to win these lovelies from TI am in love with the geometric shapes and the bezels. Great ideas all! Love how a Tierra Cast Finding takes jewelry up a level and gives it that extra bit of bling! Another great Tierracast giveaway!!!! Thank you!!!! Very awesome. I love the quality of all the Tierracast products. Love to win this one. They make the best stuff. I love TierraCast findings. Great giveaway! Love Tierra Cast ! Quality you can see! Would love to win some Tierracast !!! I am a blog subscriber. I am very happy to see TierraCast introduce ball chain, because it is so difficult to find good quality ball chain. I love their charms and pieces. Thanks for the chance to win - very innovative company! Great giveaway. Also am a blog subscriber. Thanks for the chance to win. The TierraCast Collection is so nice! I love the different colors of ball chain. 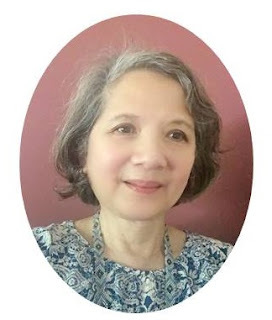 I receive emails of blog posts - rochelleth@hvc.rr.com Thanks for such a nice giveaway. Great Tierra charms. Great ideas for kumihimo. Hope I win. Thanks for all of the good ideas. Love TierraCast's products and love your ideas Pearl! I'm a blog follower, subscriber and fb follower.. Pretty things!! I would love to win these charms. 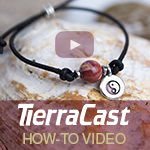 Have used Tierra Cast charms and think they're some of the best on the market. I'm a blog follower and subscriber. I like all the charms but my favorite has to be the paw prints!! So cute. These charms would be great accents to the bracelets I am making. It would be so much fun to work with these charms and chains! 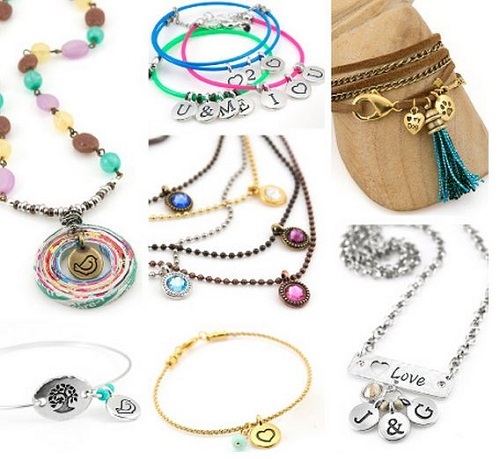 what a great giveaway, Love the ideas I have been an avid Macramé jewelry creator for more than 30 years and these charms look adorable on the bracelets, would love to win this mix of charms. Great collection!! I love charms and love to see different ways to use them! Wow, I SO want to win this collection! I have lots of ideas for their use already. Thanks for giving me the opportunity. Thanks so much for all you do for those of us who follow you! Wow! 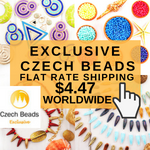 Love the crystals-easy special earrings, bracelets, etc. Blog follower. Wow Fantastic Giveaway! I love Tierra Cast and Swarovski Crystals. I really like the new little bezels. I also love your black, gold and silver bracelet. Love, love, love cute charms! And would really Love winning this!!! Thanks! So pretty and so cute! Would love to win! Lots of lovelies, thanks for the chance to win. I love jewelry making supplies and I would love to win these. These products are so well made. Your ideas are very inspiring. Thanks for the chance to win. I enjoy reading your blog which I get through the email. I'm sure my son would love to use these with me. I love this prize thanks for the chance to win!